Identification: This species is distinctive in having large, flattened, "blade like" rhinophores. The body is translucent with green branches of the digestive gland and a dark green patch in front of the pericardium. 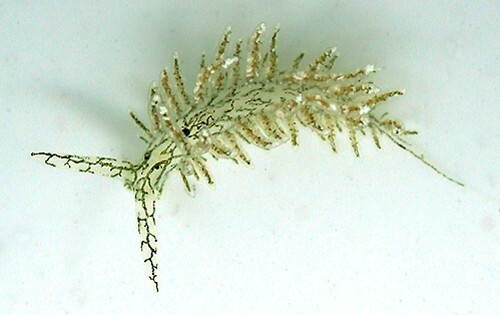 The slender cerata contain branches of the digestive gland with short side branches. Natural history: The one known animal was found at between 3 and 14 m (10 and 46 ft) in a moderately exposed rocky habitat. It showed a diurnal activity pattern while held. Distribution: Maui: may also have been recorded from southern Japan. Taxonomic notes: First recorded in Hawaii from Ulua Beach, Maui by CP on July 6, 2005. Photo: CP: 4 mm: Ulua Beach, Maui; July 6, 2005.